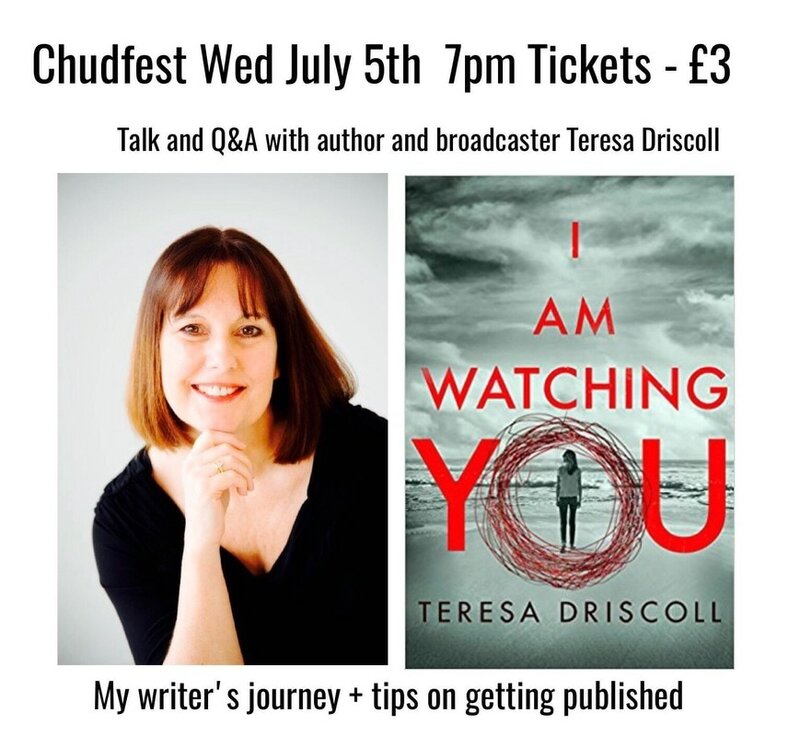 Come and meet me in Chudleigh! Hold the date! Oct 11th 2017. Event to launch my new book I Am Watching You. 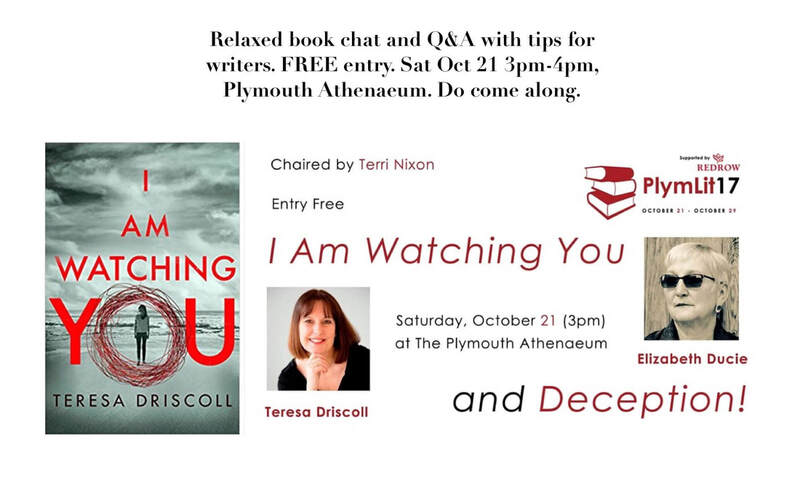 I am delighted to be joining this FREE event at the Plymouth Athenaeum on Sat Oct 22 3pm to 4pm. We will be sharing tips for writers and taking questions. It will be a fun, informal session so do pop along if you can. 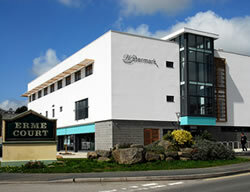 I am delighted to be giving a talk about my writing life and my debut novel RECIPES FOR MELISSA at Ivybridge Library, The Watermark, at 7.30pm on Friday, February 27th. I will be chatting about my career in journalism and television and my long journey to realising my dream of becoming a novelist. I am also happy to take questions. Tickets for the event are £2 direct from Ivybridge library. More details HERE . 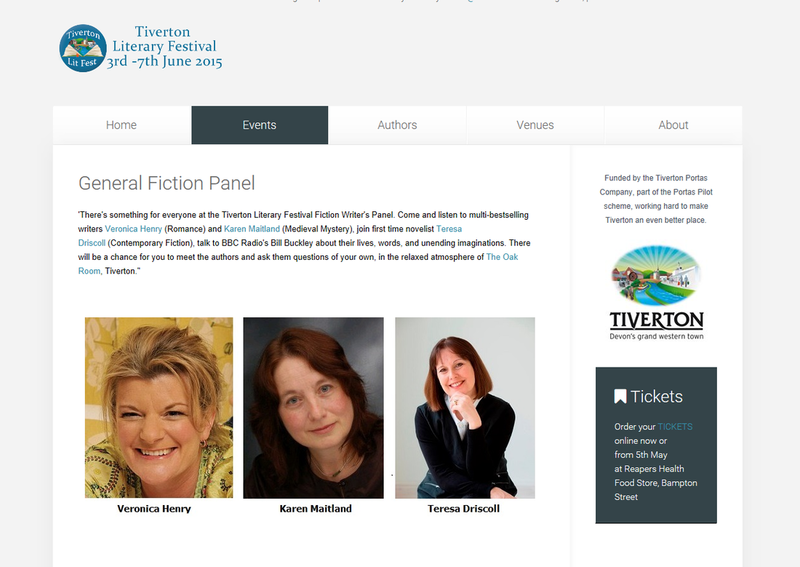 "Short Stories : for pleasure and for profit"
Journalist and author Teresa Driscoll is taking her Short Story Workshop on tour – visiting ten Devon libraries in Autumn 2014 thanks to a grant from Arts Council England. The funding means Teresa, with project partner Devon Libraries, can offer 100 FREE places to aspiring writers of short fiction. 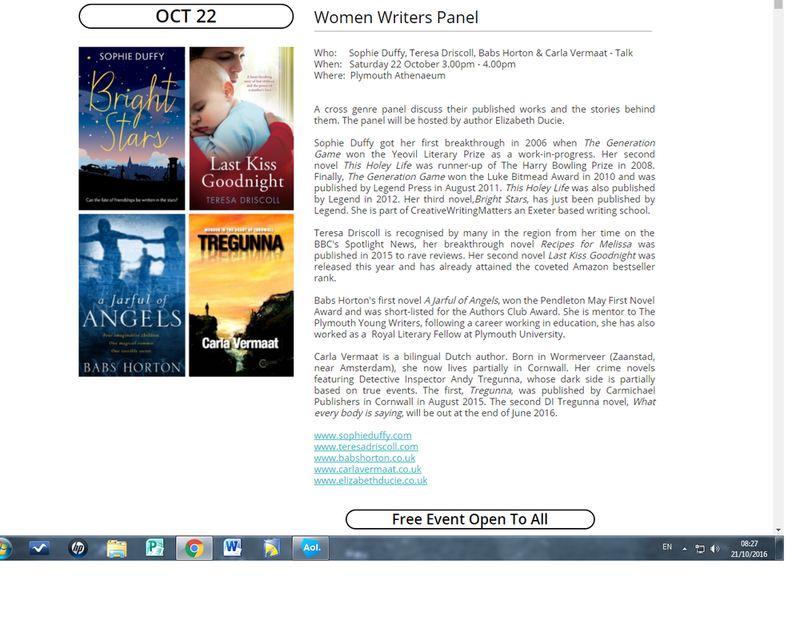 Tour dates and venues are listed below with details of how writers can apply for a place. Each three-hour creative writing workshop for ten writers, aged 18+, will follow the same format as Teresa’s popular session included in the Watermark Summer Arts Festival 2013. ﻿Colin Bray, Devon Libraries' Development Officer said: "I am delighted that libraries across Devon will be venues for Teresa's writing workshops. Not only do libraries offer a space in which people can feel comfortable and safe in sharing ideas and creative energy, but libraries also remind us of the importance of both reading and writing for pleasure﻿." Teresa Driscoll, a household name in the south west, has been making her living from words for more than 30 years. Teresa worked extensively as a newspaper reporter and feature writer before moving into television as a reporter and presenter of BBC TV’s Spotlight news for 15 years. Alongside her journalism, she has been writing fiction for years and her short stories, columns and features are published in a wide range of national and county magazines. Teresa is a member of the Society of Authors and is represented by a leading literary agent. What makes a good story? Where to start. How to find inspiration for your fiction…and confidence as a writer. Your characters and your voice. Workshop exercises and ideas to develop your characterisation, style and your unique voice as a writer. And finally… How to edit, submit to publishers and competitions plus crucial tips on how to cope with the glorious ups and downs of the writer’s life. All the workshops will run from 10am – 1pm. Tutor - Author, journalist and former BBC Spotlight TV presenter Teresa Driscoll. This workshop – as part of the Watermark’s Summer Arts Festival - is designed to help new and aspiring writers of fiction to develop their talent and find out what sells. Workshop tutor is Teresa Driscoll, a household name in the south west, who has been making her living from words for more than 25 years. Teresa worked extensively as a newspaper reporter and feature writer before moving into television as a reporter and presenter. Alongside her journalism, she has been writing fiction for years and her short stories, columns and features are published in a wide range of national and county magazines. Teresa is a member of the Society of Authors and is represented by a leading literary agent. Your characters and your voice. Workshop ideas to develop your characterisation, style and your unique voice as a writer. Fee: £15 payable in advance.